Because Syrian hamsters do not get along very well with other hamsters, they may become lonely if left alone for long periods. Fortunately, these hamsters generally bond well with their human companions. Of course, fully taming your hammy won't happen overnight; be prepared to spend several weeks working with your new pet. 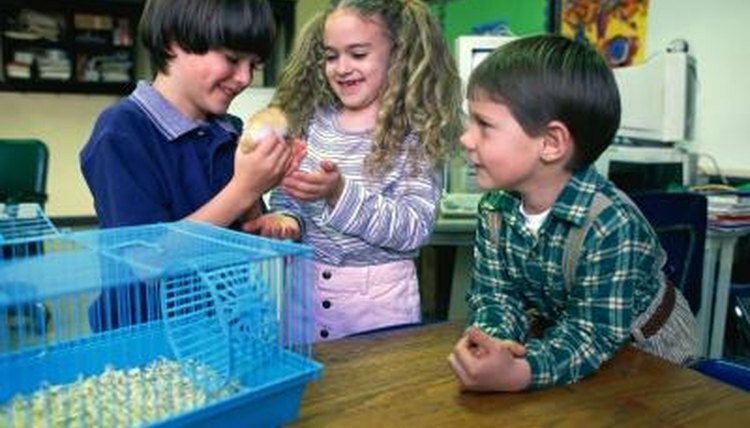 Syrian hamsters are nocturnal, so plan bonding time and activities around their schedule for the best results. Consult your vet if your new hamster refuses to be picked up or shows other signs of being unwell. Allow your Syrian hamster to adjust to his new environment before trying to tame him. He'll likely be confused and frightened by the changes in his surroundings since you brought him home. Do not try to handle him for several days after setting up his new cage. Move your hamster's cage to a central location in your home once he's settled into his habitat. This allows him to see you and hear your voice throughout the day and night. Keep in mind, though, that hamsters have sensitive hearing; do not place his cage in a noisy area or near a television set. Speak to your Syrian hamster calmly and often, and avoid making loud noises or sudden movements in his presence until he's tame. Place your clean, closed hand inside your hamster's cage a couple of times each day for several days and let him get used to your scent. Unless he's very shy, he should approach your hand and sniff it. Feed your hamster treats from your hand once he gets used to your scent. Place a treat on the palm of your hand and let your Syrian approach and take it. If he does not take the treat, let him sniff your hand and then place the treat into his food bowl for later. Do this for several days before attempting to pick up your hammy. Watch for signs that your hamster is becoming comfortable around you, such as quickly approaching when you place your hand in his cage and reacting positively to the sound of your voice. Once these signs are present, place your hand in his cage with your palm facing up. Let him climb onto your hand, and then gently cup your hand and remove your Syrian from his cage. Sit on the ground to prevent injuring your hammy in the event he jumps or falls from your hand, and use your free hand to gently pet his back. Spend time playing with and touching your pet Syrian every day to ensure he becomes and remains fully tame.  Long-haired Syrians need regular grooming. Use this time to bond with your pet. ⚠ If you are out of contact with your hamster for more than a few days, he may need time to become familiar with your scent again before you pick him up. ⚠ Do not wake your hamster for play or bonding unless you enjoy getting bitten.